Sign up for free and just shop with Skyscanner as normal. Our members earned £10,000+ at Skyscanner in the past month. Skyscanner cashback can be earned simply by clicking through to the merchant and shopping as normal. Skyscanner Cashback is available through TopCashback on genuine, tracked transactions completed immediately and wholly online. 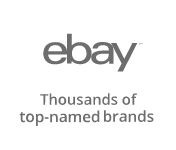 If you earn cashback through this merchant, payouts cannot be made by Adidas e-Gift card, Adventure Card by Geronigo e-Giftcard, All Bar One e-Gift Card, Amazon.co.uk e-Gift Card, Arcadia e-Gift Card, Ask Italian e-Gift Card, Bonmarché e-Gift Card, British Airways Executive Club, Caffe Nero e-Gift Card, Carluccios e-Gift Card, Chef & Brewer Pub e-Gift Card, Crown Carveries e-Gift Card, Currys PC World e-Giftcard, Ember Inns e-Gift Card, FatFace e-Gift Card, Fayre & Square Pub e-Gift Card, Flaming Grill Pub e-Gift Card, Footlocker e-Gift Card, Gap e-Gift Card, Google Play e-Gift card, Greene King Pubs e-Gift Card, Halfords e-Gift Card, Harvester Pubs e-Gift Card, Hungry Horse Pub e-Gift Card, Hungry Horse Pub e-Gift Card, Innkeeper's Lodge e-Gift Card, intu e-Gift Card, JoJo Maman Bébé e-Gift Card, Love2Shop, Love2Shop e-Giftcard, M&S e-Gift Card, Masterchef e-Giftcard, Miller & Carter Steakhouse e-Gift Card, Mococo e-Gift Card, Nicholson's e-Gift Card, Not On The Highstreet e-Gift Card, NOW TV Entertainment Pass, NOW TV Kids Pass, NOW TV Sky Cinema Pass, O’Neill’s e-Gift Card, PayPal, Pizza Express e-Gift Card, Pizza Hut e-Gift Card, Primark e-Gift card, Reward Wallet, Starbucks e-Gift Card, Stonehouse e-Giftcard, Tesco e-Gift Card, The Dining Out Card e-Gift card, The Great British Pub e-Gift card, The Restaurant Card e-Gift Card, Thomas Cook e-Gift card, Ticketmaster e-Gift Card, Toby Carvery e-Gift Card, Uber Eats e-Gift Card, Uber Rides e-Gift Card, Vintage Inns e-Gift Card, Virgin Experience Days e-Gift Card, Virtual Mastercard® Prepaid Card, Xbox e-Giftcard, Xbox Live Gold Subscription e-Giftcard, Zizzi e-Gift Card. Travel search site Skyscanner allows you to plan and book from millions of options at the best available prices. The service they provide is completely free and unbiased, and is used by 60 million people every month to view flight, hotel and car hire options. They use unique proprietary technology to connect people to the travel products they need, while their free mobile app has been downloaded more than 70 million times. The service is always free for travellers and they never charge commission, while they work with airline and travel agent partners in various ways. 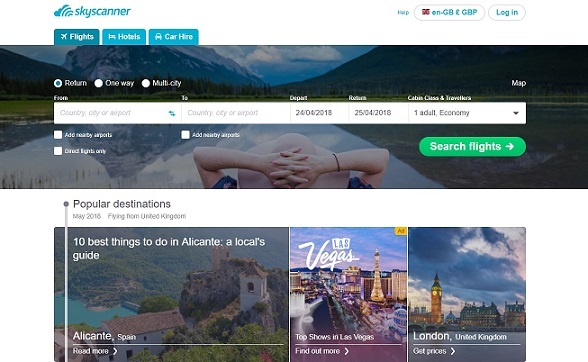 Some give Skyscanner a commission for every booking made through them or for every visit to their website, while others advertise on the website and app. However, adverts are always labelled or separated from search results. Skyscanner was founded in 2003 and now employs more than 900 people in offices around the world. If you are planning on jetting off on holiday, you can use Skyscanner's cheap flights search to compare millions of prices and find the best available deal from leading and budget airlines. No matter where you are thinking of flying to, make sure you do not pay any more than you have to by taking a look at the Skyscanner deals on offer. When you search flights, you can opt to look for one-way, return or multi-city flight tickets. Just type in your departure and destination airports, your dates, the number of passengers and whether you are looking to travel in an economy or business class cabin. You can even add nearby airports to your first choice and highlight if you are looking for direct flights only. The best bit is there are no charges for using the Skyscanner service. View recommended destinations based on your departure airport, while you can explore maps and deals if you are open to suggestions. Search for a flight on Skyscanner and hit the Get Price Alerts button and they will send you an email if the price changes. What's more, sign up to TopCashback using the form at the bottom of this page and you could earn yourself some cashback when making a booking. If you are in need of a place to stay, you will find plenty of Skyscanner hotels to choose from as they search suppliers such as Hilton, Booking.com and Expedia to find the best prices. They are able to search more than a million hotels, apartments and hostels, and allow you to compare accommodation by price, location, star rating and more. If you are in need of a little inspiration, meanwhile, you can take a look at their hand-picked hotel destinations, including New York, Paris, Dubai and Barcelona. As well as flights and hotels, you can also book your airport transfers and car hire through Skyscanner by comparing the best deals available. If you need to arrange airport transfers, just enter your details and they will help you choose a reliable company and find a fantastic deal in one of more than 1,700 worldwide locations. You can also instantly compare prices from leading rental companies if you are looking for car hire and then book directly with one. If you need a vehicle to go exploring on holiday, Skyscanner search thousands of destinations to ensure you can get around for less. Just enter the location and dates, and once you have chosen a deal, they will transfer you to the rental company to make the booking. Visit the Skyscanner website and you will be able to find places which are perfect for you to stay in and explore from, based on your interests. They encourage travellers to share photos and tips on where to go and what to do in order to help others book the perfect trip for them. You will discover that thousands of hotels around the world have been reviewed by the Trip.com community, meaning you can find rooms in your ideal destination based on your interests and budget. Just choose from a list of countries and cities, enter your check-in and check-out dates and get searching. Trip.com searches all of the leading booking sites to ensure you get the best deal. As well as hotels, you can also search for activities and places to eat. If you already know where you want to book Skyscanner flights to, their travel guides offer all the information you could need about your chosen destination, including the weather, tourist attractions and eating out. If you are not sure where to go, they are great for helping you make a decision. Skyscanner is a leading global travel search site, a place where people are inspired to plan and book direct from millions of travel options at the best prices. 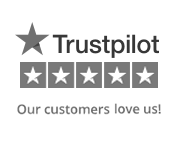 We are unbiased and free, which means that the 60 million people who use us every month can trust our comprehensive range of flight, hotel and car hire options. Our secret is in our unique proprietary technology that connects people directly to everything the travel industry has to offer. We also power travel search for over 1200 partners through our Skyscanner for Business products.